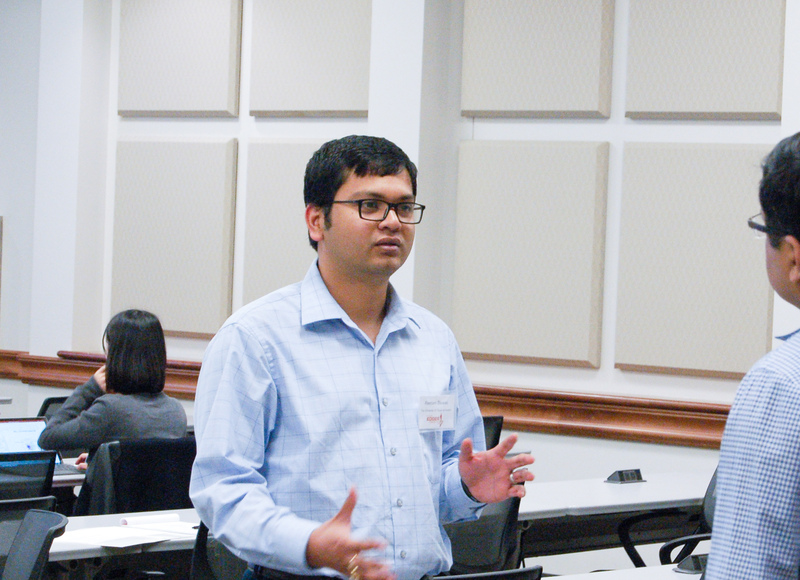 Last month, industry scientists gathered at the University of Texas at Austin to hear research updates from the UT-Austin EDGER Forum, an industry consortium that sponsors education and research in exploration geophysics. 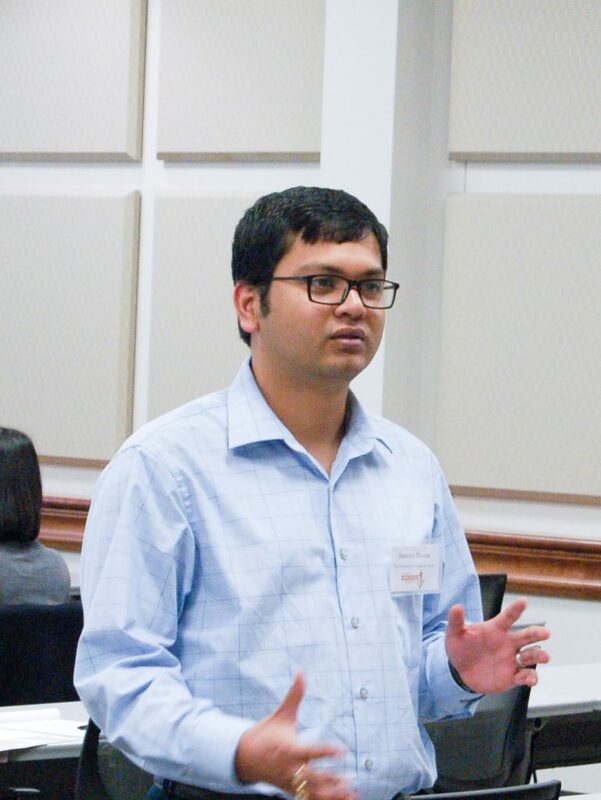 Students funded by the EDGER Forum presented their research, including promising machine learning algorithms designed to quickly model underground hydrocarbon reservoirs in unprecedented detail. This, and other work presented at the meeting, could have immediate applications in industry, helping companies explore and develop conventional and unconventional energy reserves. The consortium was founded nearly two decades ago by Bob Tatham, Emeritus Professor at the University of Texas Jackson School of Geosciences. In that time, the EDGER Forum has graduated dozens of students and published hundreds of papers. Today the consortium is led by Principal Investigator and interim director of the University of Texas Institute for Geophysics (UTIG), Mrinal Sen and co-investigators Kyle Spikes and Nicola Tisato, both Professors at the Department of Geological Sciences of the Jackson School. Each investigator has expertise in a different aspect of geophysical exploration, covering numerical simulations, theoretical physics and lab experiments. The overall goal of the consortium’s research efforts is to keep pushing the boundaries of what we can learn about the Earth from seismic data. Dr. Sen says that the EDGER Forum is unique because it is the only group in the country where all three aspects of geophysical research can be found under one consortium. His own group handles wave propagation simulation and techniques for imaging and seismic inversion. Co-investigator, Kyle Spikes, does theoretical rock physics and quantitative seismic interpretation. After Nicola Tisato joined the Department of Geological Sciences as Assistant Professor, the EDGER Forum was able to add a new dimension to the program in terms of experimental rock physics. 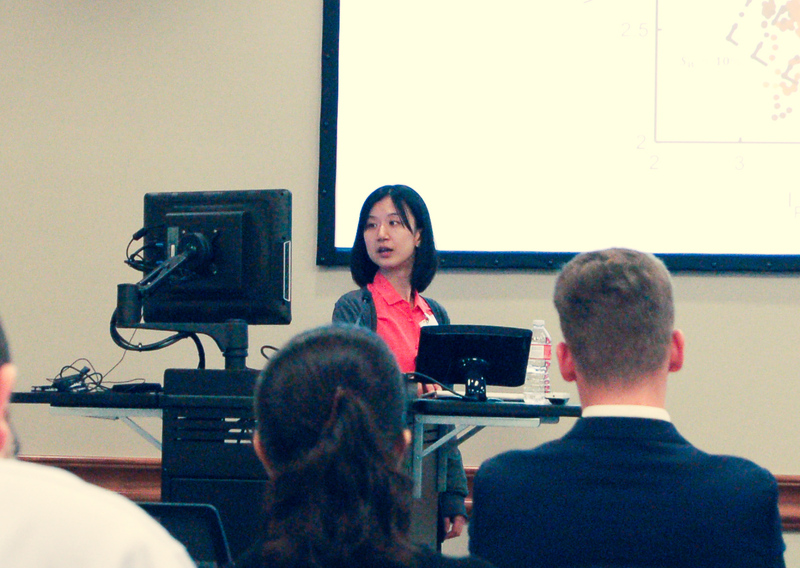 Jackson School graduate student, Wei Xie, presents her research to industry scientists and research colleagues. This broad set of expertise, alongside state-of-the-art laboratories at the Jackson School and advanced supercomputers at the Texas Advanced Computing Center (TACC), mean that the consortium has the flexibility to tackle almost any geophysical problem presented by their industry members. Dr. Sen says this flexibility has contributed to the consortium’s ability to weather the recent downturn in the industry and has helped bring members back to the group. Collaboration between industry and academia is useful because industry companies tend to have access to field data that are beyond the means of most university research groups. When interdisciplinary research groups, such as those in the EDGER Forum, work with large field data sets, the resulting research can lead to significant breakthroughs. One such breakthrough came in the form of an algorithm called Stochastic 1D Inversion developed by PhD student, Reetam Biswas. Reetam explains that the code is a way of cutting the time it takes for scientists to calculate the properties of underground rocks. “Inversion is basically a way of finding rock properties from seismic data,” he says. “The information you get from seismic data is indirect so the conventional method is very computationally intensive. This algorithm is actually not only accurate, but also quite a bit faster than existing methods.” The British oil and gas multinational, BP, implemented the research code last year with Reetam’s help during a summer internship. Email us at utig@ig.utexas.edu or contact the webmaster at social@ig.utexas.edu.